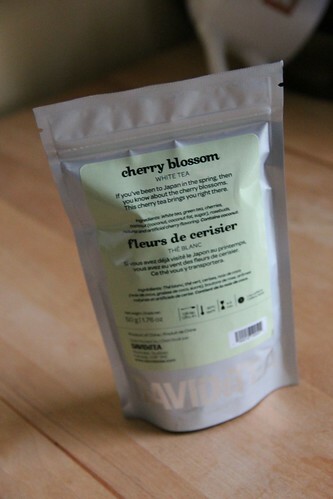 I was watching a knitting podcast a few weeks ago (I confess I forget which one it was) and the host mentioned she was drinking some Cherry Blossom tea, a seasonal blend from David’s Tea. I was very curious about this blend, and popped over to David’s Tea and ordered a bag. I can’t say enough good things about their shipping – it came from Canada and was in my hands in just a few days! 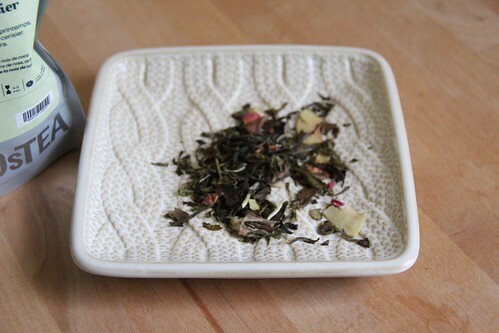 From the packaging, the blend contains green and white tea, cherries, coconut, and rosebuds. It’s available in the following sizes: 50g for $11.75, 100g for $23.50, 250g for $58.75, and 500g for $117.50. When I first opened the bag it smelled heavenly – I could smell the sour cherry and almost a fruity, heady blossom smell. I could also see whole cherries, big chunks of coconut and rose petals. While brewing I got flashes of white and green tea, and milder smells. The tea itself was very light and refreshing with hints of cherry and coconut. I really enjoyed it hot, but I think it would be excellent iced as well. I’m so glad I checked this one out and I suspect it will be on my order each spring! Next The Corner of Knit & Tea: Episode 39, Handbrake Giveaway!